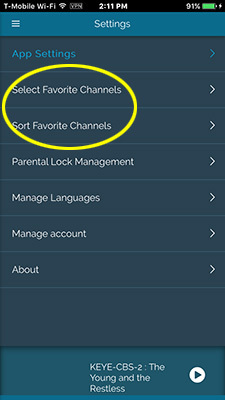 The Settings menu is used to establish and sort Favorite Channels and view information about how the Stream2 app is configured. The other menu items under the Settings menu are disabled in this release. The Settings menu is used to manage favorite channels and other Stream2 settings. 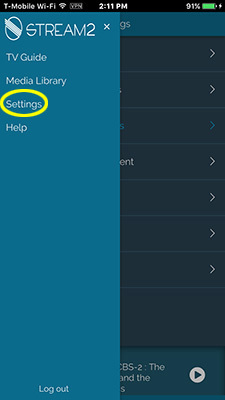 Users also access information about the app itself via the Settings menu. 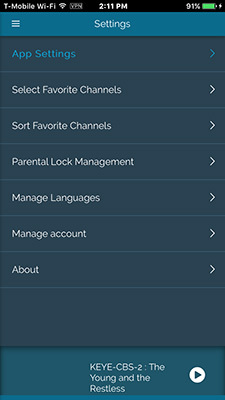 Several of the Settings menu options are not used in this release of Stream2: App Settings, Parental Lock Management, Manage Languages, and Manage Account. 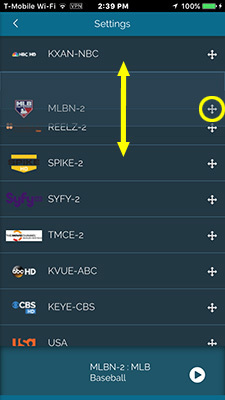 Stream2 allows users to establish some (or all) of the programs in the EPG as Favorites. Using the Favorites feature also allows users to hide channels that are not "favorited" from here. Tapping on the box to the right of the channel will make it a favorite. 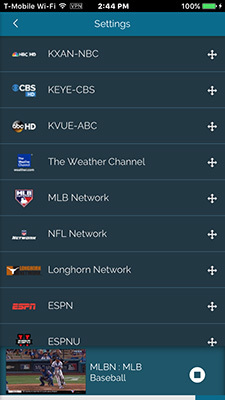 All channels can be selected as Favorites, so the entire EPG can be sorted to the user's preference. 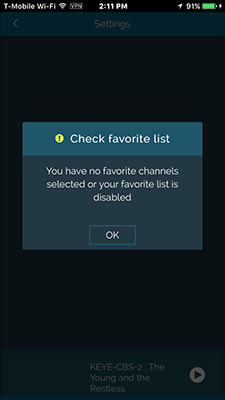 Channels that are not selected as Favorites can be hidden so they don't appear in the EPG. 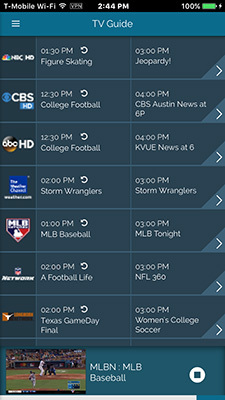 As Favorites, the user can establish a custom sequence of channels in the EPG. To sort, position a finger on the bi-directional arrows at the right side of the channel item (MLBN-2 in the example below), and then drag the channel up or down to resequence it in the channel list. Drag as many channels as you want, to create a custom channel sequence. 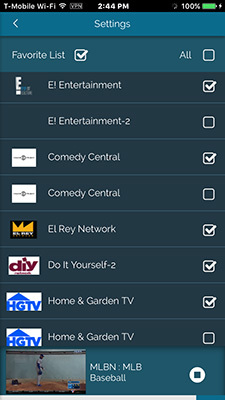 After leaving the Settings > Sort Favorite Channels menu, the sorted list will appear in the EPG. If no favorites have been selected, channels cannot be sorted. The About screen under Settings provides detailed information about the Stream2 software release and the user's device. When you are reporting an error or possible bug in Stream2, this information is useful to Apogee Support and to the app vendor.